Living as our True Authentic Self in a personal undivided house of consciousness opens us to living cohesively with others in the WE experience. Being able to discern our True Authentic Self, our thoughts and feelings from the thoughts and feelings of others, including the collective, is what empowers us to embody the Integrity Effect in the WE experience. What Is the WE Experience? I define the WE experience as balanced living with an equal emphasis on service to self and service to others. The WE experience is more than uniting with others in the name of community. The role of the individual in the true WE experience is not diminished for the overall whole. Rather, the role of the whole individual is pivotal and is directly proportional to the role and value of community cohesion. There is an ebb and flow in this symbiotic dynamic; at times the individual is more self-driven than community oriented, and at other times the individual is more service driven and focused on supporting others. Service to self is what enables service to others to sustainably occur. Compassion for self is what allows for true compassion for others. Love for oneself, as an individual, is what allows for love of others to ripple sustainably into community. The WE experience honors the role of the individual as the catalyst for creative action, imagination, and collective evolution. The “I” matters. Individuals foster Imagination, Ingenuity, Invention, and Infinite potential. While there is no I in WE, there is no true WE without I. Individual I is not separate from WE. Rather, individual I is an extension and expression of WE, and WE is an extension and expression of I. The two are symbiotic and synergistic. Equanimity is a necessary facet of the WE experience and is key to the physics embedded in the Integrity Effect. Consider that humanity cannot truly thrive together without the unique contributions of the individuals. We must be whole unto ourselves first and foremost and not look to the WE experience for validation or completion. Validation and completion are our individual birthrights. Completion is innate to True Authentic Self, and the truly authentic WE experience reflects this inherent truth. So how do we recognize our True Authentic Self amid a sea of emotions that are often Wemotions (other people’s emotions)? We can leverage heart-centered awareness to attune to emotional intelligence. What are emotions? The Oxford English Dictionary defines an emotion as “a strong feeling deriving from one’s circumstances, mood, or relationships with others: Instinctive or intuitive feeling as distinguished from reasoning or knowledge.” So an emotion is defined as a feeling, but what does that really mean? So, what is the difference between an emotion and a feeling? While the two terms are often used interchangeably, some scientists propose they are not the same. Antonio R. Damasio, renowned neuroscientist and current director of the USC Brain and Creativity Institute, has spent the past thirty-plus years striving to show that feelings are what arise as the brain interprets emotions. Emotions themselves, he posits, are purely physical signals of the body reacting to external stimuli. Then we identify, interpret, and label. Consider a feeling of “having butterflies in your stomach,” the sense of excitement you may feel when you anticipate something great is about to happen. The “excitement” is a description of the emotion flowing through your nervous system, followed by a thought of “excitement” that you have labeled as a feeling in response to your physiology by virtue of associating that response to an anticipated event. However, the emotion and the physiology of excitement are virtually identical to the emotion and physiology of nervousness, which, if consistent, can be labeled as anxiety. Our bodies do not know the difference between excitement and nervousness. Rather, it is our mind that interprets the emotion through thought that is then labeled as a feeling of nervousness/anxiety. Next time you are feeling nervous or anxious, ask yourself if you are really nervous or anxious, or perhaps you are excited about the unknown possibilities that await you beyond the label. We are wise to flow with our emotions and closely discern our thoughts and assigned feelings. We are wise to limit our labels, for labels limit us. Emotions can serve as powerful placeholders in our awareness. When we identify with the emotions through habitual thought, feeling, and labels, we may miss the opportunity the visiting emotions may be there to present. Our emotions are gifts of awareness that can unwrap our True Authentic Self. We are all empathic. Some people are more aware of this aspect of the human experience than others. Often, when growing up, children feel the emotions of parents and family members without knowing they are not their own. If a parent is often angry, then the child may take on that emotion and assume it is his or her feeling. The child will feel angry without knowing why. If a parent is very fearful, then the child will receive the fear signals and run these emotions through his or her own physiology. Children are naturally and noticeably empathic, as they have not placed filters on this innate nature. Over time, children may develop strategies to cope with untoward and unidentifiable emotions. They may revert inside themselves, taking on a shy filter or persona, or they may act out the angry or fearful behaviors at unpredictable times. They become victim to their physiology rather than developing a strong sense of their own individuality, with the ability to discern which are their emotions and which are the emotions of others. For many years, I was unaware of my empathic nature. I did not know where my emotions ended and others’ emotions began. This created a lot of confusion for me growing up, as I would often feel moody and required a lot of alone time. My parents thought there was something wrong with me. I actually remember making a choice to hide this empathic part of myself, so that I didn’t have to see a doctor. I can only wonder how many children are inappropriately medicated with neuroleptic and mood-stabilizing drugs simply because they do not have a language and structure for understanding their emotions and the emotions of others. There is an emerging awareness of a new class of people being labeled/diagnosed with HSP (highly sensitive person). It is estimated that 20 percent of the human population would test positive for what Carl Jung called innate sensitiveness. This innate sensitivity has been well researched, and the term highly sensitive person was coined in 1996 by Elaine N. Aron, PhD, and explored in her book “The Highly Sensitive Person: How to Thrive When the World Overwhelms You”. According to Aron and colleagues, as well as other researchers, highly sensitive people process sensory data more deeply due to a “biological” difference in their nervous systems. This is a specific trait that was previously mistaken for innate shyness, inhibition, innate fearfulness, introversion, and so on. The existence of the trait of innate sensitivity was demonstrated using a test that was shown to have both internal and external validity. Are these people innately shy, or is shy a patterned response, a schema to cope with the overwhelming emotional signals affecting the nervous system? Are only some people highly sensitive, or are we all empathic, with differing coping mechanisms for dealing with the bombardment of emotions? While I am very compassionate to the perceived pain and suffering of HSPs, as one myself, I offer the following: empaths are not victims. Empathy is a gift of human connection. We can learn to mind our state. We can learn to distinguish our emotions, thoughts, and feelings from the emotions, thoughts, and feelings of others. Furthermore, we can also function at a very high level, without the need to protect ourselves from life. Minding our state is a facet of living as True Authentic Self, and is a tremendous benefit of the Integrity Effect. When I first started teaching large seminars with several hundred people, I would experience emotional overwhelm. As I was rather adept at “feeling” what other people were feeling, I would track and experience the emotions of the entire group each day and assist people in moving longstanding patterns that were hindering their perceived life experiences. Then, at the end of each day, I would feel pummeled. I wouldn’t know if I was depressed, elated, excited, scared, suicidal, or on the brink of stroking out. I had so fully immersed myself empathically in the emotional pat- terns of group members that I neglected to mind my own state. For this reason, I developed a very useful distinction between empathy and sympathy. Furthermore, I developed a strategy that enabled me to track other people’s emotions without negatively affecting my own inner state. Many people confuse empathy with sympathy. They are not the same. Thus making a distinction between sympathy and compassionate empathy is relevant and helpful. As I often share in my teachings, sympathy is entraining in the resonant charge of whatever experience another person may seem to be having or how he or she is behaving. When we are immersed in the experience of what the person seems to be experiencing, there are no other possibility states available. When we are resonating in the person’s misery, drama, pain, rigidity — whatever the placeholder is — when we are in the placeholder, that’s the only place we can hold. Thus we experience exactly what that person is experiencing too. Compassionate empathy is a Spaceholder. In compassionate empathy, we coherently connect to another through the field of the heart. We then align our awareness, noticing whatever it is that someone may be experiencing as a pattern of information as a placeholder in awareness. This placeholder experience exists simultaneously alongside other possibility states. As a placeholder for another (connection from the heart), we are able to reflect back to the person an expanded awareness that includes the experience he or she is having in the moment. Furthermore, through compassionate empathy, we do not fully immerse ourselves in the person’s feeling states. We only sample the patterns of experience. I have learned that one of the most useful ways to mind my state while still honoring empathy is to run the patterns in front of me rather than through my own nervous system. How is this accomplished? I create holographic replicas of my self in front of me, where I can sample the emotions of the other persons. In these holograms, I have access to the exact same information in my own nervous system without the challenging impact to my physiology. In any given moment, I am able to calibrate the patterns others may be in resonance with without taking on those patterns as my own. I have shared this strategy with many highly sensitive people, creating new paths for empaths everywhere. If you suffer from the gift of empathy, try this. It can change your life. Empathy is not a weakness. Empathy is a strength that does not require protection. When we know how to mind our state, leveraging compassionate empathy, we become a vehicle for emotional intelligence and a catalyst for humanity. Heart-centered awareness enables us to access compassionate empathy, while maintaining our center, power, joy, and personal perspective, no matter what emotions surround us. Excerpted and adapted from the recently released book The Art of Limitless Living, available in Print, E-Book and Audiobook, narrated by the author. Melissa Joy Jonsson (M-Joy) is an author, a speaker, an inspirational leader, and founder and instructor of ‘M-Joy’ seminars. She is best known for her ability to engage people from all over the world to embrace True Authentic Power and intuition by playing in the field of the heart. She has a unique perspective on how we are able to experience living joyfully and loving completely. 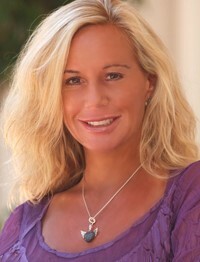 Melissa has been teaching popular life-transformational seminars around the globe since 2008. In 2014, she launched the ‘M-Joy’ seminar teachings, a unifying WE movement in consciousness dedicated to heart-centered awareness and practical personal empowerment for everyone. Melissa’s teachings are a culmination of her expansive work integrating scientific principles and spiritual concepts into practical daily experiences. She provides a new language to experience self-love as integrity. In addition to “The Integrity Effect” (2017), Melissa is the author of several best-selling books, including “Little Book of Big Potentials: 24 Fields of Flow, Fulfillment, Abundance, and Joy in Everyday Life” (2015), “M-Joy Practically Speaking; Matrix Energetics and Living Your Infinite Potential” (2014) and “Practical Play the Heart-Centered Way: A Complementary Play Guide to Little Book of Big Potentials” (2016). Melissa also coauthored, with Dr. Richard Bartlett, “Into the Matrix: Guides, Grace, and The Field of the Heart” (2013) and “The Physics of Miracles: Tapping in to the Field of Consciousness Potential” (2010). Melissa Joy is passionate about inspiring every other person to realize his or her True Authentic Self with practical, creative, and powerful wisdom. Discover how to play the ‘change game’ from the inside out, on your own heart-terms, so that the inner you matches the you without. Join inspiring, life-transformational leader Melissa Joy (M-Joy) as she journeys to the heart of interactive reality creation. Learn a powerful cohesive language and framework of completion, terminology where self-love is the new normal. Close the gap between your perceived limitations and your innate limitless potential through “The Integrity Effect”. Whether you are seeking self-love; freedom from addictions; more fulfilling relationships with family, friends, and colleagues; or to transform prevailing paradigms, the “The Integrity Effect” can light the way. This book is a journey into True Authentic Self, offering practical heart-centered approaches to extraordinary living. Gain proven strategies to create new maps for joy, fulfillment, authenticity, and True Authentic Power. Change the way you create and relate to… everything. Through a brilliant weave of unique language, authentic testimonials, and practical play, “The Integrity Effect” provides multiple access points for creating new maps to navigate through current changing landscapes. The Integrity Effect is how we Play It Forward, creating new Heart-prints to benefit ourselves and the collective alike. 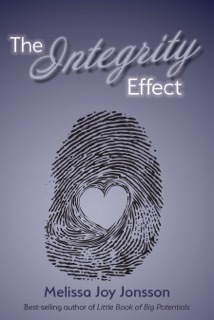 “The Integrity Effect” is available here on Amazon.